This problem is a standard Big eye vs. Big eye capturing race. In order to kill, white must reduce Black's total liberties to be less than the combination of White's outside liberties, and eye liberties (see Four is Five and Five is eight and Six is Twelve). 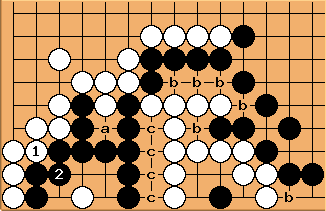 is the vital point, since it threatens to capture, black is forced to reduce his own eyespace. After this is it possible to take a simple count of liberties to determine the winner. The big eyes for both sides are identical, so they will produce the same number of liberties (which in this case is 7). 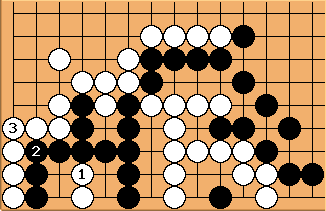 Aside from the eyes, Black has 5 liberties (external and internal, marked a), and White has 6 liberties (external only, marked b). Since white wants to capture, all of the internal liberties (c) must be filled by white, so he cannot count them as liberties. 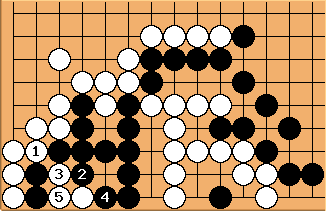 Since White has more liberties than Black, White will win and can even tenuki. If Black plays first, the liberty count will be equal, and White will have sente, enabling him to still capture. This resistance obviously fails. Black ends up with a small eye. All inside liberties count for White (see Eye Versus Eye Capturing Race). White 1 here would be a huge mistake. Black has the bigger eye and counts the inside liberties. The count is now 15 against 13. White is dead.